As of Saturday, March 26, the U.S. Embassy has advised U.S. citizens that the water in Tokyo is safe for drinking. The United States Government advises American citizens that, in accordance with guidelines that apply to water in the United States and based on analysis of tap water samples for radioactive iodine on March 24, 2011, the water in Tokyo is safe for drinking. U.S. Government officials are consulting with health experts and radiation experts, in both the United States and Japan, and are continuously monitoring the situation. If more information becomes available, we will share it with you on the Embassy Web site. Today the first funds to reach our missionary fellowship were given to the Japan Assemblies of God for relief efforts. Tony Salisbury, our field moderator, presented the funds to General Superintendent Makoto Hosoi. The funds given by Okinawa Neighborhood Assembly, a church that ministers to Japanese and to US military in Okinawa, will be used to provide relief supplies. The Japan Assemblies of God has updated their website to include a PayPal feature for direct contributions in yen or dollars. The website is http://www.ag-j.org/donation/index.html. Please pray that bureaucracy (red tape) will not slow down relief efforts as agencies have been encountering restrictions with city governments. On a positive note, the high-speed highway has opened up to civilian traffic. This will help relief teams reach more areas with needed relief supplies. This is the planned initiative of relief by the Japan Assemblies of God to the areas affected by the 2011 Tohoku Earthquake. At the moment, in order to concurrently initiate all steps of the above plan we will make use of both the material and human resources of all JAG churches, as well as outside AG support teams actively moving the plan forward. This blog will communicate one part of the Japan Assemblies of God’s relief efforts. We truly appreciate your understanding and support of our activities. Now is the time to pray for Japan like never before. We want prayer 24/7 for the relief work through CRASH and other efforts. Joyce Kitano in Tokyo: We've had a lot of aftershocks today--one in the middle of our Bible Study at the Univ of Tokyo and then about 6 or 7 after that throughout the afternoon and evening. Tonight at the Gospel Workshop at our church I gave a message on "Peace in the midst of a Shaking World" and a couple of the non-Christians were tearing up. Am praying for the reality of that peace in all of our lives. Kathryn Humphreys in Waco, Saitama Prefecture: So glad I no longer have to go to the grocery store early to buy milk! Shelley Carl in Bronx, New York (Soon to return to Tokyo, Japan to help with relief efforts): Following the earthquake 10 days ago in Japan my friend was told not to come back to work until today. Train lines were down, & they needed to conserve energy. She went back to work today and found her building was damaged. She told me that Tokyo Disneyland had a lot of damage and it is closed. There is so much going on in the country that something like Tokyo Disneyland being closed is not even reported in the news. Tonight, I will move to Manila and be engaged in editorial work of the urgent Japanese edition of OneHope (aka Book of Hope) from tomorrow to Saturday. They say they are going to publish 200 thousand copies in the initial run. Please pray that the edition will be filled with the Lord's comfort and encouragement. Pray also for Rev. Cina Silva, the editor-in-chief. Japan Assemblies of God Pastor Sakai and Staff Ko Onishi of Tokyo Urban Church delivering relief supplies to Koriyama. 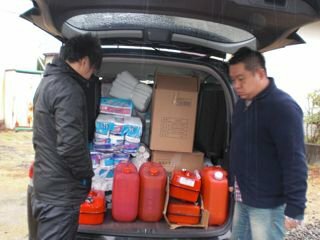 Japan churches are collecting items and sending them to the Tohoku area. Pastor Honda and Pastor Kiyosawa pose with the masks that a team will wear as they go to deliver relief supplies to the nuclear plant area. Please pray for the General Superintendent, General Secretary, the head of the Relief Action Committee and another Committee member who will be heading up to the devastated area tomorrow morning to meet with some pastors to discuss the needs and also to bring up some more relief supplies. We missionaries in Tokyo met tonight and connected with others via Skype and an iPhone to discuss relief efforts being conducted with the Japan Assemblies of God and with Convoy of Hope. Please pray for the logistical details. Although we have been told that we can move to another location like Okinawa or leave the country, all of us have chosen to stay as long as radiation levels don't present a real threat. Interestingly, we heard a couple of interesting stories about radiation levels in Tokyo. The Italian Embassy strongly urged their citizens to evacuate. Yet, a radiation check in Rome when compared to Tokyo's was found to be several times greater. Another incident includes an exchange student from Singapore who chose to stay in Tokyo. Each day he went to his university, the University of Tokyo, to check on the radiation level. He stated that Tokyo's level was lower than that of his home country, Singapore. 1. Gather all goods by church and sort them out by item. 2. Put the similar items in the same boxes. 3. Indicate what and how many items clearly on the surface of each box. 4. In case of sending different kinds of items altogether in an identical box, attach a list of the items and put it on the surface of it. Food that is raw or has a short consumer or best-taste period. Second-hand clothes are not acceptable, even if washed. (As of March 17) Lifeline has been restored in most areas where AG churches are. There still are some areas and members’ houses where water is not available yet, however. They are short of food, too, as the transport network is not fully recovered yet. Because the whole region is in the cold north and a vehicle-society, the short of gasoline and kerosene is affecting their everyday life in shopping, work and air-conditioning. Among neighbors or ‘seekers’ of the AG churches, there are people who cannot obtain information well such as senior people. Some churches, therefore, is sharing with them some relief goods necessary for everyday life such as food, drinking water, tissue paper, kerosene, etc. The Tohoku Pacific-Coastline Earthquake has created several types of sufferers. In Iwate, Miyagi and Fukushima Prefectures, there are “Earthquake Sufferers,” “Earthquake-Tsunami Sufferers” and “Earthquake-Tsunami-Atomic Power Plant Sufferers.” The sufferers who need the most urgent relief action are those from tsunami and the atomic power plant. They have not received enough assistance. 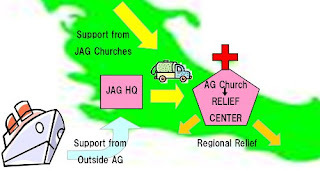 The JAG and our churches need to reach out our helping hands to these people. For a list of desired goods, please refer to other posts here. Thank you very much for your prayers and action.